IB Maths and GCSE Maths Resources from British International School Phuket. Theory of Knowledge (ToK). Maths explorations and investigations. Real life maths. Maths careers. Maths videos. Maths puzzles and Maths lesson resources. Welcome to the British International School Phuket’s maths website. My name is Andrew Chambers and I am currently working at BISP. I am running my site as the school’s maths resources website for both our students and students around the world. 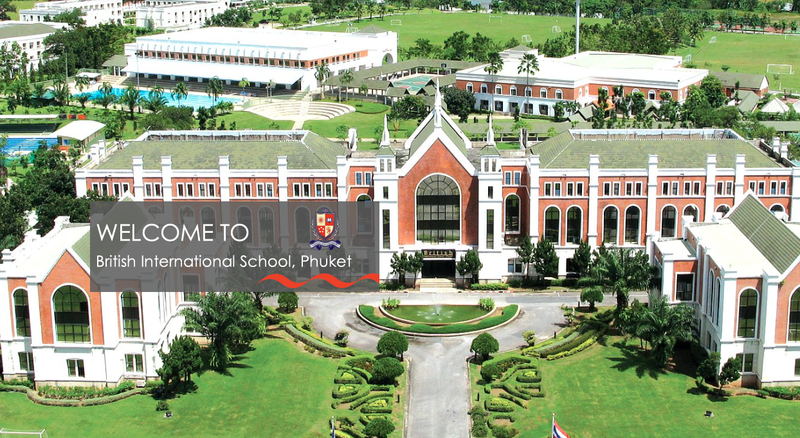 We are a British international school located on the tropical island of Phuket in Southern Thailand. We offer a number of scholarships each year, catering for a number of national and international standard sports stars as well as for academic excellence. You can find out more about our school here. There are a huge amount of resources to explore – especially for students doing their IAs and for students looking for revision videos. You may also like to try our school code breaking site – where you can compete with over 10,000 students from around the world who have made it onto our school leaderboard. There’s a really great website been put together to help IB students with topic revision both for during the course and for the end of Year 12 school exams and Year 13 final exams. I would strongly recommend students use this as a resource during the course (not just for final revision in Y13!) There are specific resources for HL, SL and Studies students. What I like about this is that you are given a difficulty rating, as well as a mark scheme and also a worked video tutorial. Really useful! The Practice Exams section takes you to ready made exams on each topic – again with worked solutions. This also has some harder exams for those students aiming for 6s and 7s. The Past IB Exams section takes you to full worked solutions to each full paper. and lastly you can also get a prediction exam for the upcoming year. You can also download the Mathematics Studies SL Formula booklet and the Standard Level Formula booklet from here if your teachers haven’t given you a copy. I would really recommend everyone making use of this – there is a mixture of a lot of free content as well as premium content so have a look and see what you think. The video above gives a fantastic account of how we can use technology to generate the Mandelbrot Set – one of the most impressive mathematical structures you can imagine. The Mandelbrot Set can be thought of as an infinitely large picture – which contains fractal patterns no matter how far you enlarge it. Below you can see a Mandelbrot zoom – which is equivalent to starting with a piece of A4 paper and enlarging it to the size of the universe! Even at this magnification you would still see new patterns emerging. Here Z is a complex number (of the form a + bi) and c is a constant that we choose. We choose our initial Z value as 0. Z1 = 0. We then choose a value of c (which is also a complex number) and see what happens when we follow the iterative process. As we continue this process Zn spirals to infinity. What we are looking for is whether this iterated Z value will diverge to infinity (i.e get larger and larger) or if it will remain bounded. If diverges to infinity we colour the initial point 2i+1 as blue on a complex axis. If it remains bounded we will colour it in black. In this case our initial point 2i+1 will diverge to infinity and so it will be coloured in blue. So, let’s use Geogebra to see this is action. The Geogrebra online program for this is here. Zn+1 = Zn2 + 0.23 + 0.42i. Z2 = (0)2 + 0.23 + 0.42i. Z2 = 0.23 + 0.42i. Z3 = Z22 + 0.23 + 0.42i. Z3 = (0.23 + 0.42i. )2 + 0.23 + 0.42i. Z4 = (0.1065 + 0.6132i)2 + 0.23 + 0.42i. We carry on with this iterative process and plot the points that we get each time. We can see the (0.23, 0.42), (0.1065, 0.42) and (-0.13467199, 0.5506116) correspond to the first coordinates on the spiral after (0,0). We can see that as this process continues we see a convergence to a point close to (0.05, 0.45). Again we have a stable spiral which spirals around a geometric shape and does not diverge to infinity. This time we can see that the orbit of points does not converge, but instead it diverges to infinity. This is the Mandelbrot Set – and will keep producing fractal patterns as you zoom in to infinity. Numberphile have a nice new video where Matt Parker discusses all different types of numbers – including “normal numbers”. Normal numbers are defined as irrational numbers for which the probability of choosing any given 1 digit number is the same, the probability of choosing any given 2 digit number is the same etc. For example in the normal number 0.12345678910111213141516… , if I choose any digit in the entire number at random P(1) = P(2) = P(3) = … P(9) = 1/10. Equally if I choose any 2 digit number at random I have P(10) = P(11) = P(12) = P(99) = 1/100. It is incredibly hard to find normal numbers, but there is a formula to find some of them. We can see that we are already seeing a reasonably similar distribution of single digits, though with 4 and 5 outliers. As the number progressed we would expect these distributions to even up (otherwise it would not be a normal number). One of the potential uses of normal numbers is in random number generators – if you can use a normal number and specify a digit (or number of digits) at random then this should give an equal chance of returning each number. We can see that in the last limit 3 to the power n+1 will grow faster than 3 to the power n, therefore as n increases the limit will approach 0. Therefore by the ratio test the series converges to a real number. Which we can see are all very close to the expected value of 10,000 (+/- around 1%). This is even closer to the expected values of 100,000 with most with +/- 0.25 %. Proving that pi is normal would be an important result in number theory – perhaps you could be the one to do it! Crack the Beale Papers and find a $65 Million buried treasure? The story of a priceless buried treasure of gold, silver and jewels (worth around $65 million in today’s money) began in January 1822. A stranger by the name of Thomas Beale walked into the Washington Hotel Virginia with a locked iron box, which he gave to the hotel owner, Robert Morriss. Morriss was to look after the box for Beale as he went off on his travels. In May 1822 Morriss received a letter from Beale which stated that the box contained papers of huge value – but that they were encoded for protection. Beale went on to ask that Morriss continue to look after the box until his return. He added that if he did not return in the next 10 years then he had instructed a close friend to send the cipher key on June 1832. After that time Morriss would be able to decipher the code and learn of the box’s secrets. Well, Beale never returned, nor did Morriss receive the promised cipher key. Eventually he decided to open the box. Inside were three sheets of paper written in code, and an explanatory note. The note detailed that Beale had, with a group of friends discovered a seam of gold and other precious metals in Santa Fe. They had mined this over a number of years – burying the treasure in a secret location for safe keeping. The note then explained that the coded messages would give the precise location of the treasure as well as detailing which men were due a share. Morriss devoted many years to trying to decipher the code in vain – before deciding at the age of 84 in 1862 that he should share his secret with a close friend. That friend would later publish the Beale Papers in 1885. The pamphlet that was published stirred huge interest in America – inspiring treasure hunters and amateur cryptographers to try and crack the code. The second of the 3 coded messages was cracked by the author of the pamphlet using what is known as a book code. The United States Declaration of Independence was used as the book to encode the message above. The first deposit consisted of ten hundred and fourteen pounds of gold, and thirty-eight hundred and twelve pounds of silver, deposited Nov. eighteen nineteen. The second was made Dec. eighteen twenty-one, and consisted of nineteen hundred and seven pounds of gold, and twelve hundred and eighty-eight of silver; also jewels, obtained in St. Louis in exchange for silver to save transportation, and valued at thirteen thousand dollars. In 1983 2 amateur treasure hunters were jailed for trying to dig up graves in Bedford, sure that they were about to find the missing gold. In 1989 a professional treasure hunter called Mel Fisher secretly bought a large plot of land after believing that the treasure was buried underneath. However nothing was found. Up until now all efforts to crack the code above have ended in failure. Perhaps the pamphlet was a giant hoax? Or perhaps the treasure is still waiting to be found. The town of Bedford still receives visitors from around the world, keen to try and crack this centuries old puzzle. You can hire metal detectors and go looking for it yourself. The map above from 1891 shows the 4 mile radius from Buford’s tavern which is thought to contain the treasure. Maybe one day Beale’s papers will finally be cracked. For more information on this topic read Simon Singh’s excellent The Code Book – which has more details on this case and many other code breaking puzzles throughout history. If you want to try your own codebreaking skills, head over to our Schoolcodebreaking site – to test your wits against students from schools around the world! Geometry is a discipline which has long been subject to mathematical fashions of the ages. In classical Greece, Euclid’s elements (Euclid pictured above) with their logical axiomatic base established the subject as the pinnacle on the “great mountain of Truth” that all other disciplines could but hope to scale. However the status of the subject fell greatly from such heights and by the late 18th century it was no longer a fashionable branch to study. The revival of interest in geometry was led by a group of French mathematicians at the start of the 1800s with their work on projective geometry. This then paved the way for the later development of non-Euclidean geometry and led to deep philosophical questions as to geometry’s links with reality and indeed just what exactly geometry was. Projective geometry is the study of geometrical properties unchanged by projection. It strips away distinctions between conics, angles, distance and parallelism to create a geometry more fundamental than Euclidean geometry. For example the diagram below shows how an ellipse has been projected onto a circle. The ellipse and the circle are therefore projectively equivalent which means that projective results in the circle are also true in ellipses (and other conics). Projective geometry can be understood in terms of rays of light emanating from a point. In the diagram above, the triangle IJK drawn on the glass screen would be projected to triangle LNO on the ground. This projection does not preserve either angles or side lengths – so the triangle on the ground will have different sized angles and sides to that on the screen. This may seem a little strange – after all we tend to think in terms of angles and sides in geometry, however in projective geometry distinctions about angles and lengths are stripped away (however something called the cross-ratio is still preserved). We can see in the image above that a projection from the point E creates similar shapes when the 2 planes containing IJKL and ABCD are parallel. Therefore the Euclidean geometrical study of similar shapes can be thought of as a subset of plane positions in projective geometry. Taking this idea further we can see that congruent shapes can be achieved if we have the centre of projection, E, “sent to infinity:” In projective geometry, parallel lines do indeed meet – at this point at infinity. Therefore with the point E sent to infinity we have a projection above yielding congruent shapes. Projective geometry can be used with conics to associate every point (pole) with a line (polar), and vice versa. For example the point A had the associated red line, d. To find this we draw the 2 tangents from A to the conic. We then join the 2 points of intersection between B and C. This principle of duality allowed new theorems to be discovered simply by interchanging points and lines. Poncelet was another French pioneer of projective geometry who used the idea of points and lines being “sent to infinity” to yield some remarkable results when used as a tool for mathematical proof. Poncelet claimed he could prove Pascal’s theorem (shown above) where 6 points on a conic section joined to make a hexagon have a common line. He did this by sending the line GH to infinity. To understand this we can note that the previous point of intersection G of lines AB’ and A’B is now at infinity, which means that AB’ and A’B will now be parallel. This means that H being at infinity also creates the 2 parallel lines AC’. Poncelet now argued that because we could prove through geometrical means that B’C and BC’ were also parallel, that this was consistent with the line HI also being at infinity. Therefore by proving the specific case in a circle where line GHI has been sent to infinity he argued that we could prove using projective geometry the general case of Pascal’s theorem in any conic . This branch of mathematics developed quickly in the early 1800s, sparking new interest in geometry and leading to a heated debate about whether geometry should retain its “pure” Euclidean roots of diagrammatic proof, or if it was best understood through algebra. The use of points and lines at infinity marked a shift away from geometry representing “reality” as understood from a Euclidean perspective, and by the late 1800s Beltrami, Poincare and others were able to incorporate the ideas of projective geometry and lines at infinity to provide their Euclidean models of non-Euclidean space. The development of projective geometry demonstrated how a small change of perspective could have profound consequences. An n digit number is narcissistic if the sum of its digits to the nth power equal the original number. 32 + 62 = 45. Therefore 36 is not a narcissistic number, as my answer is not 36. 13 + 23 + 43 = 73. Therefore 124 is not a narcissistic number as my answer is not 124. The question is how to find all the narcissistic numbers less than 1000, without checking 1000 different numbers? Let’s start with 1 digit numbers. Therefore all numbers from 0-9 are narcissistic. a2 + b2 = 10a + b.
a2 – 10a + b2 – b = 0. (10 – a)2 – 10(10 – a) = a2 – 10a. Therefore we prove that there are no 2 digit narcissistic numbers. 13 = 1, 23 = 8, 33 = 27, 43 = 64, 53 = 125, 63 = 216, 73 = 343, 83 = 512, 93 = 729. 13+ b3 + c3 = 100 + 10b + c.
99 ≤ b3 + c3≤ 198. 13+ 53 + 33 = 153. This gives the following possibilities for b and c: 6 0, 0 6, 6 1, 16, 2 6, 6 2, 6 3, 3 6, 6 4, 4 6. None of these give narcissistic numbers. This gives the following possibilities for b and c: 6 4, 4 6, 6 5, 5 6, 7 1, 1 7, 7 2, 2 7, 7 3, 3 7, 7 0, 0 7. 0, 1, 2, 3, 4, 5, 6, 7, 8, 9, 153, 370, 371, 407. Is there a limit to how many narcissistic numbers there are? 10u(log9 -1) + u + 1 = 0. Now we can clearly see that 10u will grow much larger than u + 1, so any root must be for u is small. Let’s see, when u = 1 we get a positive number (as log9 -1 is a negative number close to 0), but when u = 2 we get a negative number. Therefore we have a root between u = 1 and u = 2. Given that we made the substitution logn = u, that means we have found the inequality n(9)n < 10n-1 will hold for n somewhere between 101 and 10 2. 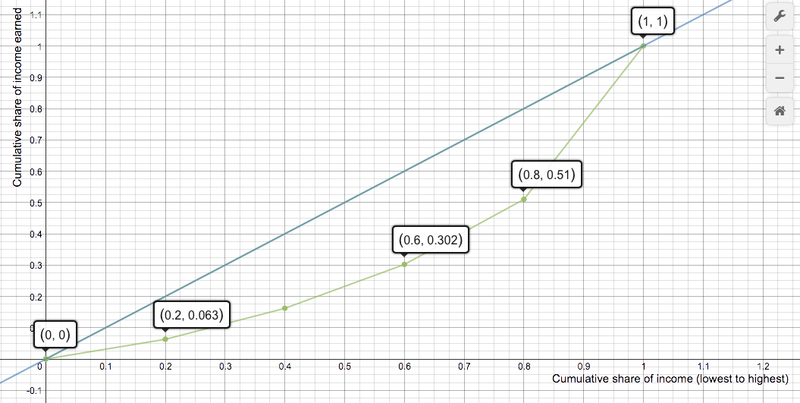 Using Wolfram we can see that the equality is reached when u = 1.784, i.e when n = 101.784 or approx 60.8. Therefore we can see that when we have more than 60 digit numbers, it is no longer possible to make narcissistic numbers. Quantum mechanics is the name for the mathematics that can describe physical systems on extremely small scales. When we deal with the macroscopic – i.e scales that we experience in our everyday physical world, then Newtonian mechanics works just fine. However on the microscopic level of particles, Newtonian mechanics no longer works – hence the need for quantum mechanics. Quantum mechanics is both very complicated and very weird – I’m going to try and give a very simplified (though not simple!) example of how probabilities are at the heart of quantum mechanics. Rather than speaking with certainty about the property of an object as we can in classical mechanics, we need to take about the probability that it holds such a property. We can then create an apparatus (say the slit below parallel to the z axis) which measures whether the particle is in either up state or down state. If the particle is in up spin then it will return a value of +1 and if it is in down spin then it will return a value of -1. So far so normal. But here is where things get weird. If we then rotate the slit 90 degrees clockwise so that it is parallel to the x axis, we would expect from classical mechanics to get a reading of 0. i.e the “arrow” will not fit through the slit. However that is not what happens. Instead we will still get readings of -1 or +1. However if we run the experiment a large number of times we find that the mean average reading will indeed be 0! What has happened is that the act of measuring the particle with the slit has changed the state of the particle. Say it was previously +1, i.e in up spin, by measuring it with the newly rotated slit we have forced the particle into a new state of either pointing right (right spin) or pointing left (left spin). Our rotated slit will then return a value of +1 if the particle is in right spin, and will return a value of -1 if the particle in in left spin. Here the slit was initially parallel to the z axis in the x,y plane (i.e y=0), and has been rotated Θ degrees. So the question is what is the probability that our previously up spin particle will return a value of +1 when measured through this new slit? The equations above give the probabilities of returning a +1 spin or a -1 spin depending on the angle of orientation. So in the case of a 90 degree orientation we have both P(+1) and P(-1) = 1/2 as we stated earlier. An orientation of 45 degrees would have P(+1) = 0.85 and P(-1) = 0.15. An orientation of 10 degrees would have P(+1) = 0.99 and P(-1) = 0.01. The statistical average meanwhile is given by the above formula. If we rotate the slit by Θ degrees from the z axis in the x,z plane, then run the experiment many times, we will get a long term average of cosΘ. As we have seen before, when Θ = 90 this means we get an average value of 0. if Θ = 45 degrees we would get an average reading of √2/2. Desmos has a nice student activity (on teacher.desmos.com) modeling the number of hours of daylight in Florida versus Alaska – which both produce a nice sine curve when plotted on a graph. So let’s see if this relationship also holds between Phuket and Manchester. First we can find the daylight hours from this site, making sure to convert the times given to decimals of hours. For Manchester I needed to set the value of b (see what happens if you don’t do this!) Because we are working with Sine graphs, the value of d will give the equation of the axis of symmetry of the graph, which will also be the average hours of daylight over the year. We can see therefore that even though there is a huge variation between the hours of daylight in the 2 places, they both get on average the same amount of daylight across the year (12.3 hours versus 12.1 hours). Does the relationship still hold when looking at hours of sunshine rather than daylight? How many years would we expect our model be accurate for? It’s possible to investigate the use of sine waves to model a large amount of natural phenomena such as tide heights and musical notes – so it’s also possible to investigate in this direction as well. 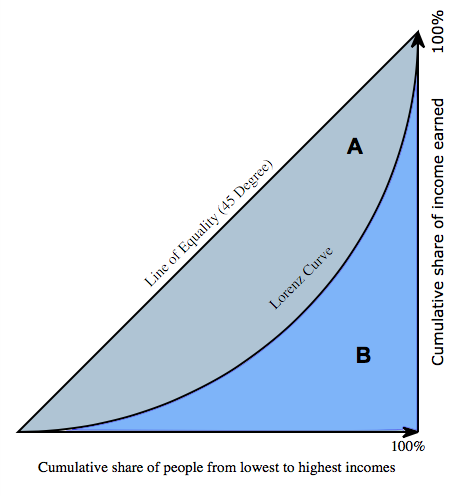 The Gini coefficient is calculated as the area of A divided by the area of A+B. As the area of A decreases then the curve which plots the distribution of wealth (we can call this the Lorenz curve) approaches the line y = x. This is the line which represents perfect equality. From the graph we can see that Thailand has quite a lot of inequality – after all the top 20% have just under 50% of the wealth. The blue line represents how a perfectly equal society would look. 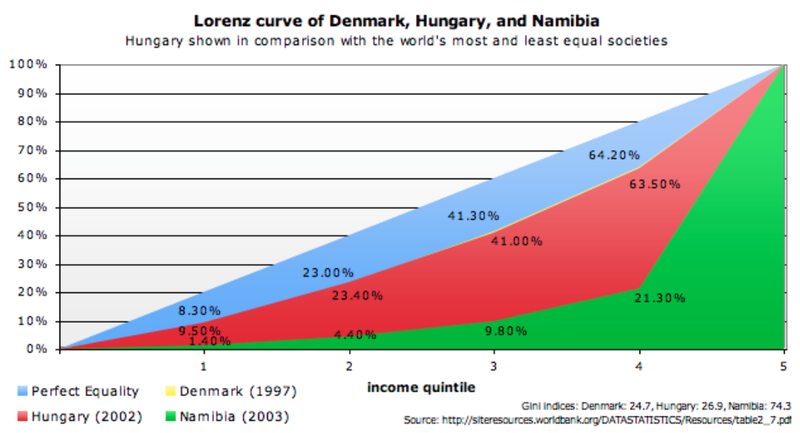 To find the Gini Coefficient we first need to find the area between the 2 curves. The area underneath the blue line represents the area A +B. This is just the area of a triangle with length and perpendicular height 1, therefore this area is 0.5. The Gini coefficient is then given by 0.1926/0.5 = 0.3852. The actual World Bank calculation for Thailand’s Gini coefficient in 2002 was 0.42 – so we have slightly underestimated the inequality in Thailand. We would get a more accurate estimate by taking more data points, or by fitting a curve through our plotted points and then integrating. Nevertheless this is a good demonstration of how the method works. In this graph (from here) we can see a similar plot of wealth distribution – here we have quintiles on the x axis (1st quintile is the bottom 20% etc). This time we can compare Hungary – which shows a high level of equality (the bottom 80% of the population own 62.5% of the wealth) and Namibia – which shows a high level of inequality (the bottom 80% of the population own just 21.3% of the wealth). 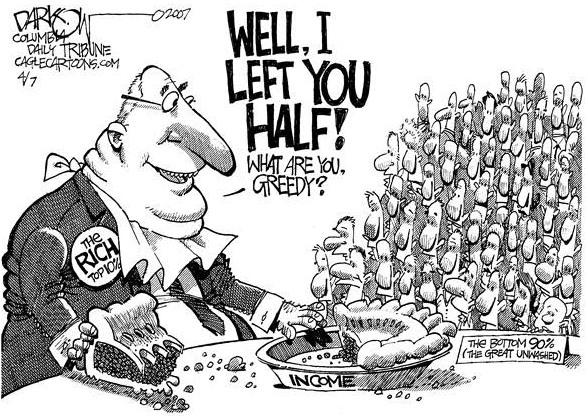 How unequal is the world? We can apply the same method to measure world inequality. One way to do this is to calculate the per capita income of all the countries in the world and then to work out the share of the total global per capita income the (say) bottom 20% of the countries have. This information is represented in the graph above (from here). It shows that there was rising inequality (i.e the richer countries were outperforming the poorer countries) in the 2 decades prior to the end of the century, but that there has been a small decline in inequality since then. The World Bank data on the Gini coefficients of different countries.